Al-James started out as a right-back with the Arsenal Youth set up. After switching to a centre-half role, he helped the Gunners win the FA Youth Cup in 1988 alongside the likes of Andy Cole and Kevin Campbell. He went on loan to Torquay United making 7 appearances during the 1989/1990 season, and in the summer of 1990, he signed a one-year contract with Arsenal. With little chance of progressing further and only playing in reserve games, he was released the following summer. Despite interest from Birmingham, Colchester and Cambridge, this interest faltered, but he played for Barnet and Harwich & Parkeston during the following season. 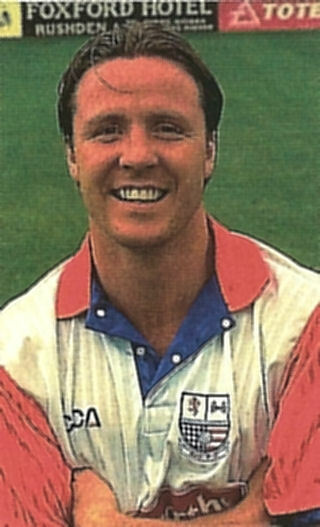 He joined Marlow for the 1992/1993 season, playing in the club’s FA Cup tie against Tottenham Hotspur. The following two seasons were spent at Enfield Town, before Roger Ashby brought him to Nene Park in June 1995 for a £5,000 transfer fee. 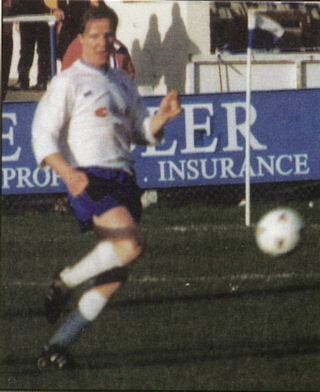 He won three Northern Ireland B International caps, and after being a regular during the 1995/1996 season, helping Diamonds to win the Southern League Premier Division, he played just two games in the Conference before he moving back to Enfield in September 1996 for a reported £6,000 fee. After completing the season at Enfield, Al-James moved to Yeovil Town in the summer of 1997 for another four figure fee (£5000). In August 1999, Slough Town paid £7,500 for his services, making 29 appearances, before returning to the Conference with Hayes in November 2000. He made numerous moved during the later part of his career. After Hayes, he played for St.Albans City before joining Dulwich Hamlet in January 2001. In December, he joined Bishop’s Stortford as club captain and helped then to promotion to the Ryman Premier in the 2001/2002 season. He had a loan spell with Carshalton Athletic in January 2003 and after his release, he joined Enfield in May 2003 (for a third spell). Moves then followed to Leyton (September 2003), Kettering Town (November 2003, where he made two appearances), Fisher Athletic (December 2003), East Thurrock United (February 2004). Another spell at Enfield followed in July 2004, before finishing his career with their arch rivals Enfield Town in January 2006. He started the 2006/07 season at Isthmian Division One North side Aveley, before finishing his career with Isthmian Division One South side Cray Wanderers, making 24 appearances later in that season.